« All My Taste Is In My Mouth? I Wish! But why is it that the Gospels are so specific about Jesus’ outspoken remarks on divorce when there are other ‘sins’ that are not mentioned? His condemnation of divorce would even appear to disregard the Mosaic laws permitting divorce, laws that are counted among those that Jesus says he did not come to abolish. Are the Gospels telling us about something rare happening here– Jesus expressly overruling an earlier Biblical instruction? (unless you think that his Sermon on the Mount is doing the same thing). But why this one? And why was the Pharisee’s question regarding divorce so tricky? John the Baptist was arrested and eventually beheaded for his outspoken criticism of Herod. In effect John was saying that Herod and Herodias were not worthy of their ruling status, that their illegitimate actions made their office illegitimate. This was not just a scripturally based Jewish perspective, Herod Antipas was not an authentic ruler but actually a puppet of the Roman Empire. When Jesus publicly condemns divorce he is implicitly, and dangerously, condemning Herod and Herodias. He surely was aware of this and considering the fact that the Pharisee’s were trying to ‘test’ him one can assume that this was another of Jesus’ prophetic responses calculated to aggravate the Jewish people’s oppressors as well as their collaborators. Herod’s marriage to his brother Areta’s wife was openly contentious and eventually erupted into war between their two provinces so Herod was not held in the highest favor by his Roman bosses. This was in spite of his immense and expensive construction projects designed to please the Emperor. The Roman buzzword was ‘peace’, a peace provided by Caesar Augustus, the “Son of God”, and Herod was expected to help maintain it. So Jesus (also proclaiming to be the Son of God) was giving not only a teaching response but also a politically radical one, as insanely radical as a Parisian publicly criticizing Marshall Petain and Hitler during the reign of Vichy France. 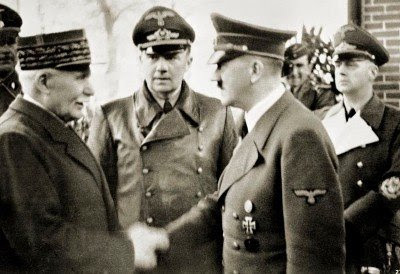 Herod was much more bloodthirsty than Petain and the Romans were every bit as brutal as the Nazis. While a firing line would inevitably be the fate of any such French political dissident, John would meet the edge of an Herodian blade and Jesus would hang on a Roman cross. Jesus’ teachings on divorce, like many of his other teachings, are not expressly about theology. Unless you happen to believe that we are all motivated by our ‘theology’. Certainly Jesus’ understanding of God’s will was instrumental in his radically dangerous criticisms of empire. This entry was posted on July 17, 2009, 1:10 pm and is filed under Bible, Christianity, Civil Disobedience, Crime and Punishment, Gospel, Jesus, Justice, Religion, Theology. You can follow any responses to this entry through RSS 2.0. You can leave a response, or trackback from your own site. Only you could make an analogy between the teachings of Jesus and French partisan. That’s the word I was looking for! Partisan. But I wouldn’t have used it anyway. Partisans would have been analogous to the militant Zealots. John and Jesus did not push violence. (Even though at times, like with Nazi occupied Germany, I’d be all for it. Didn’t do much for those who rose up against Rome, though. Honestly, in a perfect world, people would marry for life–but even religions with extreme moral codes, like Islam, allow for relatively easy divorce. Not everyone can get along when living under the same roof–no matter how well intentioned. Was Jesus speaking in contrast to the Pharisees’s (and Greek culture’s) practice of easy divorce, or was He establishing a standard for the Kingdom of God–or was He saying that except in extreme cases, stay married. Ah, my point was that it was none of those things. The next time your boss tells you something, try and read a double meaning into the words. In other words, if the Gospel texts have any reflection of Jesus’s words, then what is said is probably what is meant (regardless of the accuracy of the statement). So what did Jesus mean by His words about divorce? That’s actually not bad advice. Never having managed people in a business setting you probably have never encountered the overly literal employee who ONLY does precisely as he is told or perhaps follows the instructions so ‘religiously’ that he botches things up….”But that’s what you TOLD me to do!” It helps to understand your bosses general intent (bad bosses kept this secret – Jesus did not). Maybe His teachings are more practical than theological? You’re right, I’ve never been in management, and I understand giving instructions to students who are literal in their interpretation. Or both. I don’t think Jesus would have made a distinction between the practical or ‘real’ world and the theological or spiritual one. And I don’t think he wanted us to this either. Our theology really does drive everything we do.